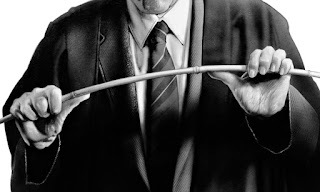 During my time in junior school, I was petrified of the cane in Mr Coleman’s study. As headmaster, he was the only teacher allowed to dish out ­ punishment to errant 10-year-olds. I worked hard to make sure I never crossed him, or any other teacher for that matter.When I think back, the fear of bamboo on youthful fingers was the biggest deterrent of all in keeping boisterous pupils on the straight and narrow. My Dad wasn’t averse to clipping me around the ear when I stepped out of line at home; indeed he occasionally whacked me on the back of the head and was promptly ticked off by my stepmother for overstepping the mark. To anyone under 40, the above scenario must sound Dickensian and to some extent it was. But whilst I was a bit of a naughty kid at home, I made sure I kept on the right side of the school authorities. Only once was I marched to Mr Coleman’s study and that was for stupidly lobbing a lump of coal onto the school playground. Don’t ask me where the coal came from because I haven’t a clue. Mind you, this was South Wales and at the time I was very much a minor. Anyway, you can imagine how this cowardly coal-chucker ­reacted when the headmaster brought out his cane. I burst into a flood of tears and apologies... and literally begged for mercy. My emotional plea had the desired effect on Mr C, though I’ll never know if the cane would have hurt my hand more than his alternative punishment – the exertion of writing by hand 100 times, ‘I shall not deliver coal to the school playground’. Even the most badly-behaved kids I grew up with were angels ­ compared to the arrogant, rebellious, knife-carrying yobs of 2015. And I am convinced the appalling behaviour of so many 21st-century youngsters is rooted in the absence of physical discipline. What makes it worse is that in many cases, the parents of these kids are as bad as their offspring because they also grew up knowing they could take liberties with adults with no fear of punishment. The fear of physical retribution certainly taught kids of my generation to respect authority. And you’ll struggle to find anyone over 60 who doesn’t agree with that sentiment. I’ve a message for David Cameron his Commons cronies. Corporal punishment works. And it’s largely because Britain has abandoned corporal punishment that young yobs and yobesses run riot everywhere from Manchester to Magaluf. I have never come across anyone who was permanently damaged, either physically or mentally, by the after-effects of six of the best. In fact, every victim I’ve spoken to said the experience did them good. But try telling that to the politically correct dummies of Westminster who decided in 1987 to outlaw corporal punishment in state-run schools. The idealists had a ridiculous conception that they could sit brain-dead Neanderthals on their knee and talk sense into them. \Instead, we saw the emergence of a superbreed of yob - the potentially violent rebels whose behaviour is prompting more and more teachers to turn their backs on the profession they used to love. When the cane was king, the morons didn’t bother going to school. These days they revel in the opportunity to intimidate the helpless men and women charged with educating them.With no fear of painful retribution, they bombard their teachers with insolence and defiance, hoping to push their helpless victim ‘over the top’. Unless there is a dramatic turnaround in political attitudes, I ­despair of the UK escaping the scourge of the blood-and-plunder demon it has brought on itself. A scum society of scallies is running amok while their mothers and fathers enjoy the pleasantries of a comfortable jail cell or are out of their minds on drink and drugs.These lowlifes are a tiny minority, yet they are destroying British society. They respect nobody, live off the proceeds of stealing, mugging, drug pushing and benefits fraud - and even a step up into the gutter is too high a hurdle to jump. In a country where the police are not even armed, there is little chance of ridding Britain of these scumbags, or of educating them. Personally, I’m all for establishing a no-nonsense UK Guardia Civil to sort the problem out Spanish style, by treating the yobs in the only way they understand. Is there a realistic solution? I’m sure the ex-policemen and other law enforcers among The View’s readers will have something to say about that. I am at a loss as to why I am the first to comment. Are we so afraid of the PC police? I haven't come across your blogs before, this morning is my first read and I am tickled pink by your play on words, obviously you have a good command of the English language unlike those scallions you mention. All of your opinions are the reason why I became an expat/immigrant to Spain having seen the writing on the wall during the last ten years of my working life up until 2007. Keep up the good work Donna, I shall look forward to your future blogs. Yes Donna, I did receive the cane quiet a lot really, never saw eye to eye with a certain teacher, however I did deserve it each and every time. That along with the occasional clip around the ear from our local policeman kept me on the straight and narrow. Never been on benefits, never been more than a week without some form of employment from building work to City worker, never mugged or assaulted anyone and bought up two hard working respectable son's. The lawless behavior in some area's of our country sadden's me and has gone some way to keep us in Spain.